Tokyo, October 9, 2015 - NEC Corporation (NEC; TSE: 6701) today announced orders for its iPASOLINK iX all outdoor ultra-compact microwave radio systems from Turkcell, an integrated communications and technology services provider in Turkey. NEC's iPASOLINK iX will be used for the network infrastructure of the LTE services Turkcell is scheduled to launch on April 1, 2016. Turkey has experienced a rapid increase in communications traffic due to the widespread adoption of smartphones and tablet devices. In response, telecom carriers are working to introduce high-speed and high-capacity networks, including the launch of LTE services. Following the spectrum auction held in Turkey at the end of August 2015, Turkcell is set to become the only operator in the country to reach 375 Mbps mobile internet speed on LTE as of April 1, 2016.
iPASOLINK iX is a radio transmission system that supports frequencies from the 6GHz band to the 42GHz band and can be applied to a wide range of networks, from access to aggregation. 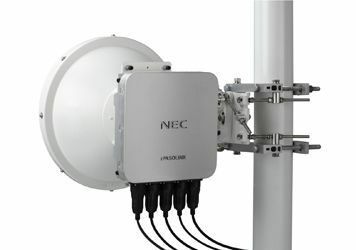 Moreover, with the sub-band free feature, a unique NEC technology, frequency bands that usually need to be configured at the factory prior to shipping can now be configured or modified at the installation location or remotely after shipping. This enables carriers to respond flexibly to various situations, such as delays in allocating usable frequency bands, or sudden changes to allocated frequency bands. "With an LTE service, our customers will not only enjoy better web access and communications, but also a vastly improved user experience for video, music, games and other multimedia content. We are working with NEC to quickly develop a highly reliable network infrastructure which will be operational by the time we launch our LTE services on April 1, 2016," said Atac Tansug, Fixed Network Director, Turkcell. "We are honored to contribute to Turkcell's development of Turkey's fastest commercial LTE service. NEC's microwave radio systems are used in the networks of telecom carriers in more than 150 countries around the world. We will leverage this track record and experience to support the speed and capacity enhancements on the Turkcell network," said Naoyoshi Takagi, President, NEC Telecommunication and Information Technology (NEC Turkey).